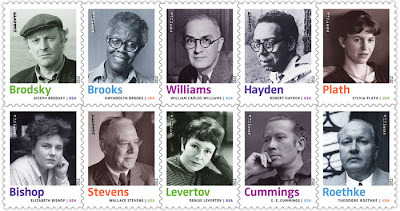 "The number of books published each year in America has been steadily increasing, and poetry is more popular than ever" the USPS writes, adding that "The ten great writers honored on the Twentieth-Century Poets stamp pane [pictured above and due out in April 2012] ... surely deserve part of the credit." We here at P&PC aren't really sure that there's a firm link between poetry's popularity and the increasing number of books being published each year, and we would have preferred to see actual poems or quotations from poems printed on these new Forever stamps, but we're not going to complain too loudly. 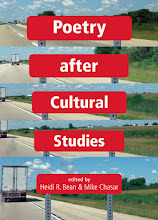 (Can you imagine the USPS quoting from Paterson, Book I: "And clerks in the post- / office ungum rare stamps from / his packages and steal them for their / children's albums"?) After all, as suggested by the 1960 edition of Edna St. Vincent Millay's Collected Lyrics pictured here—in which the cancellation mark on the 1981 stamp neatly picks up the decorative flourish motif of Millay's name—poems, books, and stamps will find each other one way or another.